No, over 100 hot springs adorn Utah. In fact, a wonderful hot spring, named Wasatch Warm Springs, is within walking distance of downtown Salt Lake City. Wasatch Warm Springs is the southernmost hot spring, in a series of four, located along three miles (5 km) of the Warm Springs fault zone. From north to south, the individual hot springs are Becks, Hobo, Clark, and Wasatch. Collectively this area is known as the Warm Springs fault geothermal area. 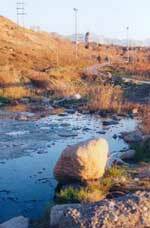 The City of Salt Lake has restored Wasatch Warm Springs and its accompanying wetlands, and is in the process of completing a new northern section of Warm Springs Park. Informational placards describing the history, ecology, and geology of the springs should be installed in time for the park’s dedication this spring. 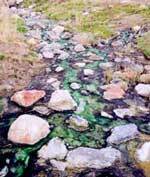 The springs are viewable year round and are especially intriguing on a cold, snowy winter day. While stopping to view the springs is well worthwhile, bathing is no longer permitted. Where does the water come from and how does it get hot? The ultimate source of the water is snow and rain falling on the Wasatch Range. Much of this water travels to the valley in streams, gets used by plants, or evaporates. The remainder percolates into the ground. This ground water slowly migrates downward and basinward through steeply inclined bedrock with a network of fractures and faults. Heat originating from within the earth’s interior warms the descending ground water and surrounding rock. From deep beneath the surface, the heated water travels back up through a conduit provided by the Warm Springs fault. The water rises so quickly, it does not have time to cool. How hot is the water and how deep does it circulate? Water temperature of Wasatch Warm Springs fluctuates seasonally between 100 and 108 F (38/ 42 C). In part, the temperature depends upon how deep the water circulates and the rate at which the temperature of the earth’s crust increases with depth (called thermal gradient). 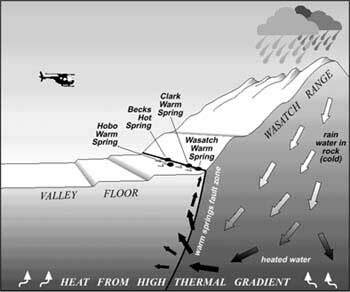 Assuming a thermal gradient of 93 F per mile of depth (32 C per km) and an average annual outside temperature (in the Wasatch Range) of 40 F (4.5 C), the water must reach a depth of approximately 3/4 mile (1.2 km) to obtain the maximum temperature of 108 F (42 C). However, upon ascending to the surface the hot water may be cooled by mixing with water near the surface and the surrounding rock. Therefore, the water must circulate through depths greater than this simple calculation suggests. The near-surface mixing probably accounts for seasonal temperature fluctuations. The new northern portion of Warm Springs Park (location of the springs) is immediately north of the Children’s Museum of Utah. The street address is 900 North 300 West. Take I-15 to the 600 North exit, turn east on 600 North, then turn north on 300 West. Travel 3 blocks to 900 North. Park in the lot on the north side of the Children’s Museum, which is on the right (east) side of 300 West. If walking or bicycling from downtown Salt Lake City, head north on 200 West. Where 200 West ends at Wall Street continue north through the old southern portion of Warm Springs Park.